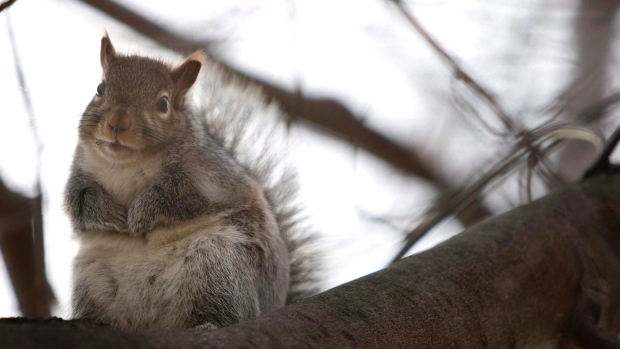 HALIFAX -- Nova Scotia's power utility, which has blamed blackouts on everything from crows and seagulls to "salty fog" over the last decade, said Friday an electrocuted squirrel left a swath of suburban Halifax in the dark. The furry critter scaled a transformer in a substation in the Hammonds Plains area just before 5 p.m. Thursday, Nova Scotia Power said Friday. Spokeswoman Bev Ware said the squirrel became a conduit for the electricity, which subsequently caused roughly 5,400 customers to lose power. The animal was electrocuted and died at the scene. Power was restored within two hours. Ware said animals were to blame for several other power outages over the last year, although she wouldn't name specific species. She said the utility has taken measures to prevent animal-related outages. "We do have animal guards that we can put in place, but we can't prevent this from ever happening," said Ware on Friday. "There's always going to be some exposed electrical equipment in a substation." Crows, raccoons and seagulls have also caused lights to go out in thousands of Nova Scotia homes over the last decade. The utility even blamed salt in heavy fog for brief, widespread outages in the Halifax area in 2006. But Halifax author Stephen Kimber, who has written about the issue, said he believes it is not a matter of curious animals or salty fog. "There are way more outages than I ever remember growing up or even as an adult here, which I think has to do with the cutbacks they've had over time and the elimination of a lot of maintenance jobs," said Kimber, who has lived in the Halifax area for more than six decades. "You can probably find that there are legitimate examples that Nova Scotia Power is using for certain power failures, but in virtually every storm, even minor rainfalls and snowstorms, the power goes out. Why does the power go out? Because they haven't put the money into making sure the system has all the backups that it needs." Kimber said his comments are only anecdotal, as there is no historical data on power outages in Nova Scotia. He said the utility or an independent body should study whether there are more outages now than in the past, and what has caused the outages historically. Ontario's Hydro One acknowledged on Friday that power outages can be caused by animal contact, and it has also dealt with such problems over the past several years.